The following instructions will guide you through making folders and drives on your local computer (Desktop, My Documents; Dropbox; Google Drive; etc.) available when using virtualized applications running inside the VMware Horizon Client in Windows. 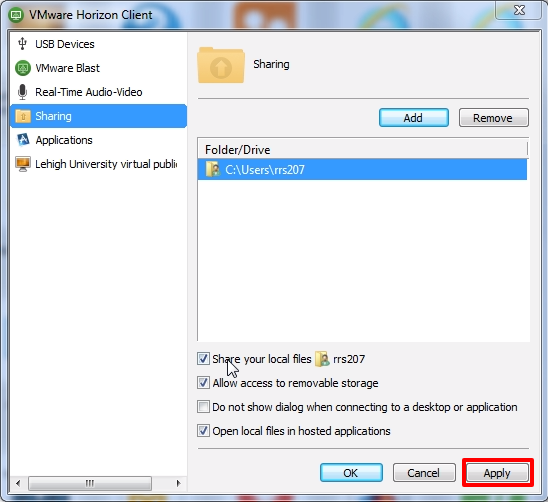 This documentation assumes you have already installed the VMware Horizon Client, and have already logged in to Lehigh's virtual software server. When you are connected to view.cc.lehigh.edu, click the Setting icon (gray gear icon). This will bring up the settings section of the VMware Horizon Client. Select Sharing from the left menu pane. Share your local files <yourusername>: This option will share all the folders within your Windows user folder including Desktop, My Documents, Downloads, etc. 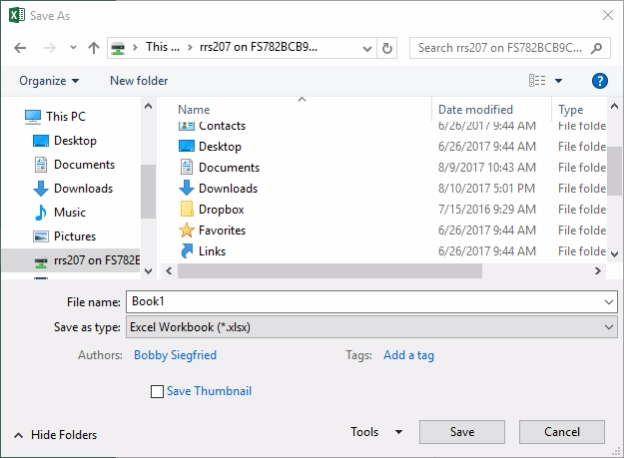 Add button: This button will allow you to browse for and select a specific folder on your computer that you want to share. You can also use this method to select a folder in a cloud drive such as Dropbox, Google Drive, or OneDrive. When you are satisfied with your configuration, remember to click Apply to save your settings. Then click OK to close the settings windows. The first time you run a virtualized application after updating your sharing settings, you may be prompted with an additional confirmation window asking you to allow the sharing. Click Allow. Select the folder/location you want to save to. Folders within the location you select will show up in the right pane of the window. In the case of the example, the Windows user folder/location is selected and the folders that show up in the right pane include the familiar Desktop, My Documents, Downloads, etc. folders.